I felt a little Hopper-esque with my composition of this piece. 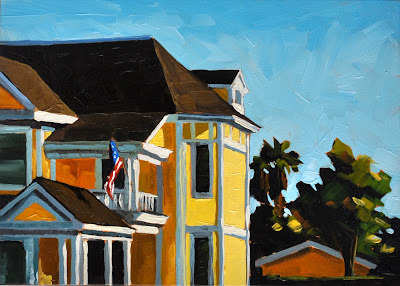 I sketched out several ways I could paint this house but I kept coming back to this one. A version of "Lighthouse Hill" by Edward Hopper. My kitchen had a big empty wall, and since I don't really like hanging up my own artwork (I'm much too critical!) I made this to fill the space.